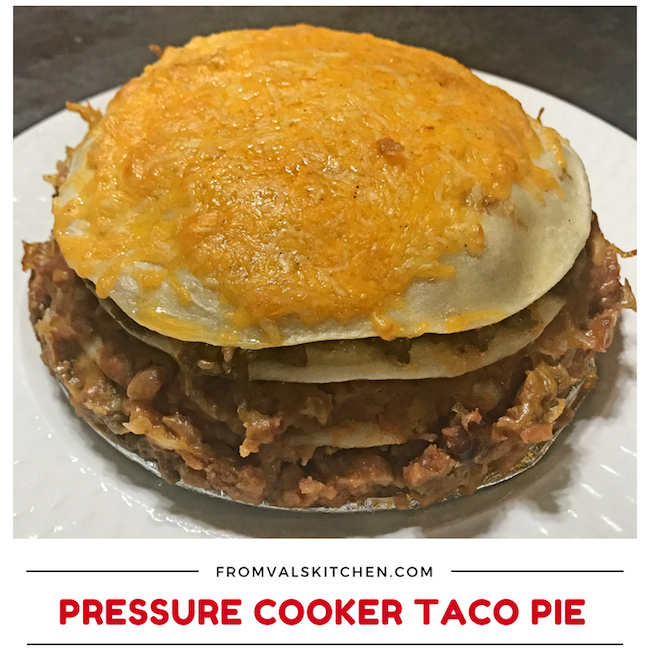 Pressure Cooker Taco Pie is a fun meal with a Mexican flavor. It takes the taste and texture of some of your favorite burrito and taco ingredients and layers them in one family-sized pie. Taco Pie is a fun meal with a Mexican flavor. It takes the taste and texture of some of your favorite burrito and taco ingredients and layers them in one family-sized pie. Preparing this meal in the pressure cooker means you aren’t heating up the kitchen with an oven and it reduces the amount of greasy mess you have to clean. 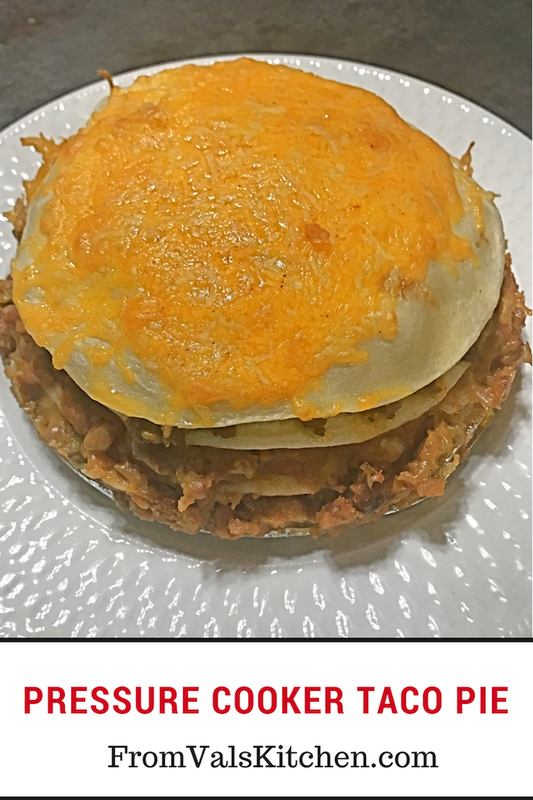 Here’s how I make Pressure Cooker Taco Pie. Select the saute setting on the pressure cooker. Place the ground beef into the pot along with the taco seasoning. Combine thoroughly and brown the meat. Remove the ground beef and place it into a mixing bowl. Add 1.5 cups of the cheese to the meat in the mixing bowl and stir well. Place the refried beans and salsa into a mixing bowl and stir to combine. Spray the springform pan with nonstick cooking spray. Place one tortilla onto the bottom of the pan. Place half of the refried bean mixture onto the tortilla and spread out. Stop a tiny bit short of the edge or your mixture will come out and be messy later as it did in my first one. Place a second tortilla into the pan. Place half of the ground beef mixture on top of the refried beans, again stopping a tiny bit short of the edge. Place a third tortilla into the pan. Place the remaining half of the refried bean mixture onto the tortilla and spread out. Stop a tiny bit short of the edge or your mixture will come out and be messy later as it did in my first one. Place the remaining half of the ground beef mixture on top of the refried beans. Stop a tiny bit short of the edge or your mixture will come out and be messy later as it did in my first one. Place a fourth tortilla into the pan. Place the pan onto the vegetable steamer and lower into the pot. Put the top onto the pressure cooker and close to seal. Set the pressure cooker to cook on manual high pressure for 16 minutes. Once the cooking cycle has finished, let pressure release naturally for 5 minutes then do a quick pressure release. Remove the pan from the pot using the handles of the vegetable steamer. Sprinkle the remaining shredded cheese on top of the top tortilla. Place the whole pan into the oven for about 5 minutes in order to melt the cheese. Remove the pn from the oven and let it cool for 5 minutes. Unlock the sides of the pan and gently remove it. Slice the pie as you need, then garnish and serve. Select the saute setting on the pressure cooker. Place the ground beef into the pot along with the taco seasoning. Combine thoroughly and brown the meat. Remove the ground beef and place it into a mixing bowl. Add 1.5 cups of the cheese to the meat in the mixing bowl and stir well. Rinse out the pot. Place the refried beans and salsa into a mixing bowl and stir to combine. Spray the springform pan with nonstick cooking spray. Place one tortilla onto the bottom of the pan. Place half of the refried bean mixture onto the tortilla and spread out. Stop a tiny bit short of the edge or your mixture will come out and be messy later as it did in my first one. Place a second tortilla into the pan. Place half of the ground beef mixture on top of the refried beans, again stopping a tiny bit short of the edge. Place a third tortilla into the pan. Place the remaining half of the refried bean mixture onto the tortilla and spread out. Stop a tiny bit short of the edge or your mixture will come out and be messy later as it did in my first one. Place the remaining half of the ground beef mixture on top of the refried beans. Stop a tiny bit short of the edge or your mixture will come out and be messy later as it did in my first one. Place a fourth tortilla into the pan. Cover the pan with aluminum foil. Place the pan onto the vegetable steamer and lower into the pot. Put the top onto the pressure cooker and close to seal. Set the pressure cooker to cook on manual high pressure for 16 minutes. Preheat the oven to 450 f. Once the cooking cycle has finished, let pressure release naturally for 5 minutes then do a quick pressure release. Remove the pan from the pot using the handles of the vegetable steamer. Remove the aluminum foil. Sprinkle the remaining shredded cheese on top of the top tortilla. Place the whole pan into the oven for about 5 minutes in order to melt the cheese. Remove the pn from the oven and let it cool for 5 minutes. Unlock the sides of the pan and gently remove it. Slice the pie as you need, then garnish and serve. Enjoy! My daughter loves TexMex and recently got a pressure cooker. The timing of this is perfect, so I’ll be referring her to your recipe. Any food with a mexican flavor is always a big hit around my house. This really looks good. Unfortunately I don’t have one of those pressure cookers. This looks so good and cheesy! 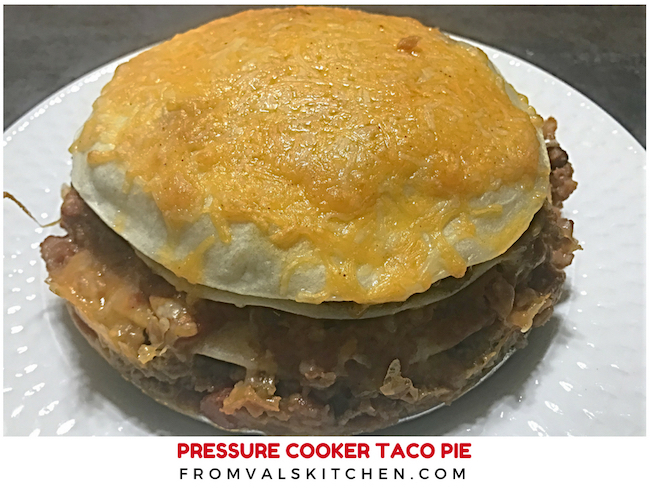 I need to use my pressure cooker to make your taco pie. My family loves Tex-Mex food. We’re all about Mexican food in this house, so I’m sure the taco pie will be devoured quickly. I need to put it on our dinner list for next week. This recipe would be perfect for taco Tuesday next week. It looks so cheesy and savory. Sounds like a good serve for a teen fling. I love my pressure cooker. It is so easy to make stuff in it. And I never thought about making something like this but I am definitely going to try it. What a great way to have a taco Tuesday but in a different fashion. 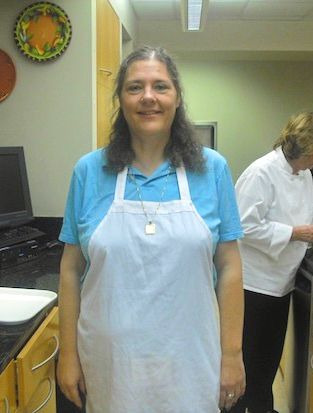 I have never used a pressure cooker. I don’t think that I even own one! This looks like a tasty recipe, though! I have never tried to make a taco pie! We love to make tacos but a pie is such a cute spin on taco night. I love taco anything, I could eat it morning, noon and night. I don’t have a pressure cooker, so I could probably finagle something in my slow cooker. I am still considering of buying a pressure cooker and now I guess I am much more convinced to get a new one. I will definitely buy a new one. I love seeing such recipes that can be done easily with the help of a pressure cooker. Taco pie sounds amazing. I still haven’t gotten a pressure cooker and I am jealous of what you can make with yours. I actually just got a pressure cooker so this is perfect for me! I love a good taco pie and this one seems absolutely delicious! Wow,t his look and sounds delicious. I have a pressure cooker that i have never used. I really need to try it out. Love my Instant Pot pressure cooker and I am always on the hunt for new recipes. This taco pie is definitely something my family would enjoy. I love a good taco pie and I haven’t had one in so long. I’ll have to give this one a shot! This is so cool! I never cooked with a pressure cooker before, but I had no idea you could so something like this! Sounds like I need to go shopping for a Pressure Cooker as this looks so good. Although I have a Instant Post and I think it does like a Pressure Cooker. I just need to get our of my comfort zone and use it. Because its wasting money sitting on the Counter not being used. This is simply amazing because I didn’t know you could make such a meal in a pressure cooker! The taco pie looks darn delicious, would like to make this soon.